Megaforce gets MegaRiffTraxed as the new VOD! I can understand if you are confused, thinking Megaforce was already done by either MST3K or RiffTrax already, but that’s not the case. Only many, shockingly similar and goofy films of dubious quality. Now, Megaforce itself is the film of dubious quality that’s getting RiffTraxxed as the new RiffTrax VOD! And, yes, it is nutty and crazy. Join Barry Bostwick, Persis Khambatta, bandanas, Mad Max cars, and an unfortunate shadow as things get ridiculous with Megaforce. Buy it today at RiffTrax.com! 1982. The decade of the action hero was underway. Within years, catchphrase-mumbling sentient biceps like Stallone, Schwarzenegger, and Guttenburg would come to dominate the cinemas. Audiences hungered for mayhem, bloodshed, and for a very brief period of time, Billy Zabka. What they got instead was Megaforce. 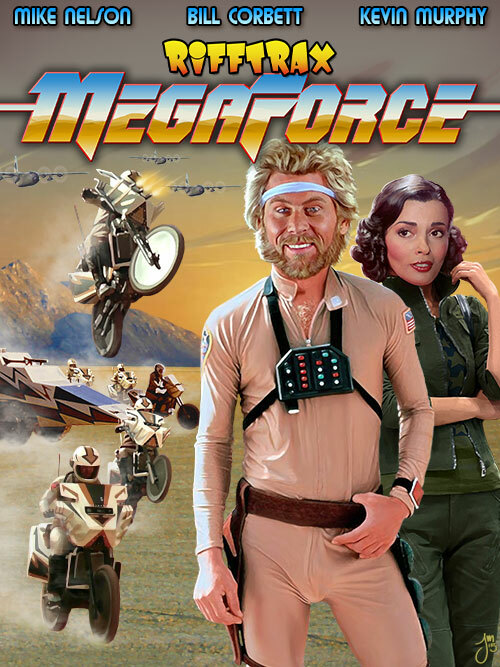 Named “Movie of the Year” by critics from a diverse array of publications including “Upsetting Jumpsuit Enthusiast,” “Dweeby Dirtbike Review,” and “Our Memories are Severely Clouded by Nostalgia Monthly,” Megaforce made film history by giving lead character Barry Bostwick both a funny headband and a funny hairstyle. They would prove to be the film’s most enduring legacy. Some viewers may criticize its paper-thin plot, tedious action sequences of no consequence, and overall cheap feel despite having a shockingly high budget for the era. To this we respond: funny headband and funny hairstyle. Leaders of the Free World have issued denials of the existence of Megaforce, but then again, seven year old Johnny Roddy saw it on Beta it at a friend’s sleepover in 1984 and said it was “Almost as badical as Condorman!” Who are you going to choose to believe? (We would point out that there is a rumor circulating over by the curly slide that Johnny Roddy eats his boogers.) Join Mike, Kevin, and Bill (who do not) for the oft-requested RiffTrax of Megaforce!